My mom is in the States right now and for pasalubong, my sister asked her to bring her a fashionable laptop bag. When my mom complained about how most of the laptop bags she saw are black, businesslike, and boring, I said that my sister is probably better off checking Multiply for cute laptop bags and sleeves. 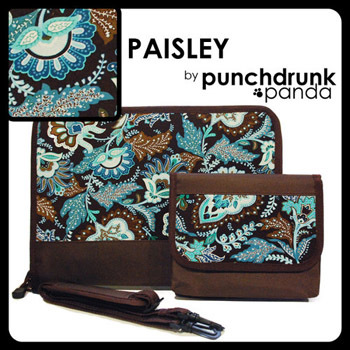 One of my favorite Multiply retailers for laptop accessories is Punch Drunk Panda, and they just released a new line of laptop sleeve designs today! (Yep, the paisley one above is part of the new collection). Each sleeve is made of black or brown polycanvas on the outside, padded with board and 5mm of foam, and lined with nylon oxford for maximum laptop protection. It also comes with a detachable strap, and a free matching charger bag where you can keep your charger, mouse, and other laptop accessories. Besides that, all orders within Metro Manila can avail of free shipping. Some of the laptop sleeve designs have only two or three pieces per size so you might want to order while they’re still in stock! Check out Punch Drunk Panda at punchdrunkpanda.multiply.com. Actually it looks quite retro with the hippy design. I like it though, alhtough I’m not sure whether it’s for men!